We routinely sedate patients for tooth extractions. As a dental office which specializes in treating nervous and/or phobic patients, we know that some procedures provoke more anxiety than others. For many, the extraction of a tooth is more stressful than almost any other dental procedure (and in many cases, more stressful than almost anything else in life!). If you are one of these types of patients – whether you need a single tooth pulled or four wisdom teeth extracted – we have a solution. And that solution is IV moderate sedation (also called twilight sedation). In IV (IV stands for intravenous) sedation, which Dr. Nick Calcaterra administers himself in our Orange, CT office, medications are given to you through an IV that relax you to the point where you feel no pain and will have little to no memory of the procedure (hence the term twilight). Many feel as if they are being put to sleep. The end result is that patients are able to overcome their fears and get the tooth or teeth removed. 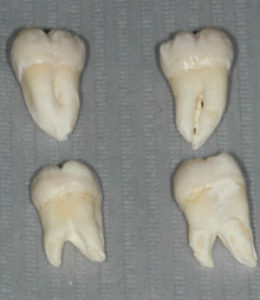 We extract wisdom teeth with IV sedation, including these 4. Let’s face it. Getting a tooth pulled is not fun. It’s not supposed to be fun. For some individuals, local anesthesia (a.k.a. novocaine) is sufficient. For others, a little nitrous oxide will suffice. But for many, the thought of a tooth extraction – which is essentially a body part being surgically removed – while they are conscious and aware is just too much. The pinch of the numbing needle, the noises, the pressure, etc. are all too much to bear. The only thing Ryan remembers from his sedation with Dr. Nick is that it didn’t hurt! Dr. Nick Calcaterra will first evaluate you, review your medical history, and then develop a plan. The tooth or teeth needing to be extracted will be agreed upon. Then, an appointment is set up. You then arrive for your appointment – usually a morning one because of the requirement to be without food or liquids for 6 hours before. Dr. Nick Calcaterra will then start your IV. If you are really nervous about this, he will have given you a sedative or he can use nitrous oxide to help. He administers medications through the IV. You start to get tired and your eyelids feel VERY heavy. The room will likely begin to be blurry and the voices will become distant and faint. You will likely close your eyes. Dr. Nick will then administer the local anesthesia (novocaine), which you won’t feel, and then remove the tooth or teeth. For your reference, we wrote a detailed guide on how we do this in our office. Based on our experience doing hundreds of sedations, 99% of our patients have no memory of the procedure. Do you need a tooth pulled? 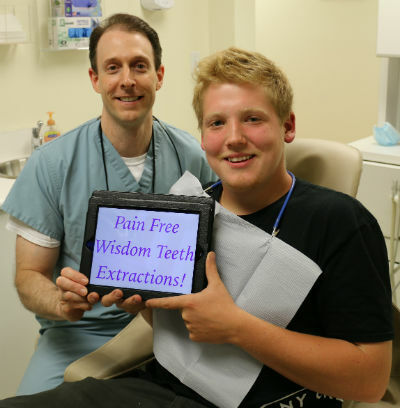 Were you told you needed your wisdom teeth extracted? 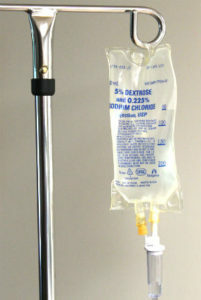 Are you interested in IV sedation? If yes, call us (203) 799-2929 or visit this page to request an appointment.